"A power drill is nothing without a drill bit or a driver bit." When I first started Dunn DIY, I really didn't know much about working with power tools. I approached them with so much caution that projects took me twice as long as they should have taken, and I was never getting to use the tool's full potential. 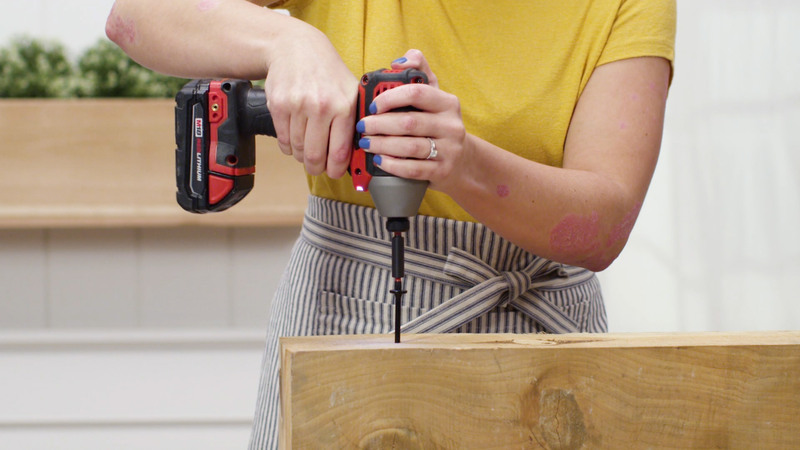 In the first part of this series, we talked about when to use a power drill before we talked about how to use a power drill. 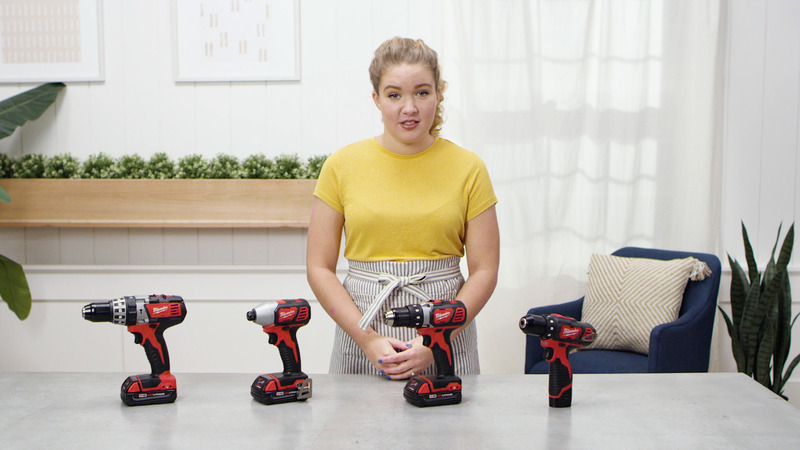 Today, we're talking what type of drill to buy. Let's get to it! It’s sometimes called a drill/driver because this tool both drills holes and drives screws. It’s a combination tool: put a drill bit in it, and you can drill a hole. Put a driver bit in it, and you can drive a screw. Power drills are commonly called power drills and electric drills. They all mean the same thing—it’s just a matter of preference. In addition to drilling and driving, you can purchase add-ons and use your power drill for, say, mixing paint. It’s an endlessly useful tool! 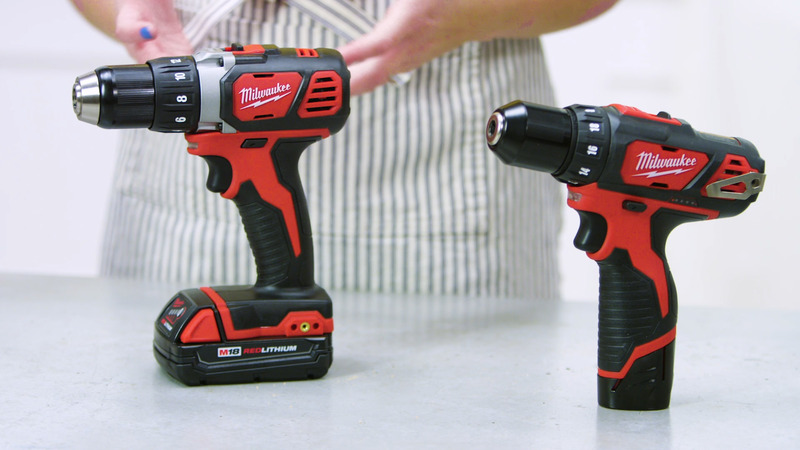 Today, we’re looking at some 12-volt (M12) and 18-volt (M18) drills from Milwaukee Tool. Both the M12 and the M18 are battery-powered drills. We like these over corded drills because battery-powered drills are more convenient (you can take it with you anywhere) and safer—no one wants to trip over cords on a job site. We encourage you to consider the different batteries in the M12 and M18 drills. 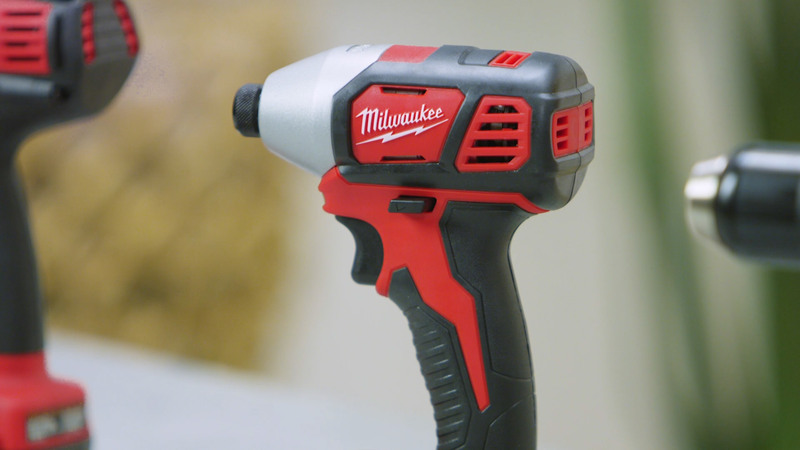 If this is your first Milwaukee tool, take a look at other tools you might want to invest in (and which battery they use) and factor this into your decision making. And of course, if you already own a battery-powered Milwaukee tool—don't forget to consider it when you're buying a new power drill. You'll probably want a drill from the same battery family as your existing tool, because it's super handy to have interchangeable batteries across some of your favorite tools. Having said that, Milwaukee Tool makes a variety of tools for both the M12 and M18 systems. For beginners (and even people who have been doing this for decades), our pick is the M12. It’s a 12-volt power drill with a 3/8" chuck. It handles most DIY and homeowner jobs just fine, and it’s a little smaller than the M18—which means it’s lighter weight, and easier to maneuver. For people who are looking to work on larger projects or are interested in sharing batteries with larger Milwaukee tools (they even make a battery powered chainsaw! ), we like the M18, which is an 18-volt power drill. It’s more powerful and the battery will last longer than the M12, but it’s also bulkier. It also has a 1/2" chuck which fits a hole saw, or other bits with a large diameter shank. The M18 is more of a luxury item, so if you’ve graduated from a basic power drill, consider this one. An impact driver is a tool that exerts force for you so your arms don’t have to do it all. Impact drivers are great for downforce (like when you're drilling into a hard surface) or when you have a large job ahead of you (like screwing down deck boards for an entire deck). A hammer drill combines some aspects of an impact driver into a regular drill/driver. There’s a “hammer setting” you can turn on to activate the cam action, which provides extra force for projects where it’s helpful. A power drill is nothing without a drill bit or a driver bit. Until you put something in the chuck, it’s essentially pointless. You can always pick up a specialty bit for a specific project, but we like having a starter kit on hand to handle basic needs and projects. Milwaukee Tool makes great driver bit sets and drill bit sets (as do other manufacturers). With these tools, you should be set for most jobs! If you are looking to build out your home workshop, review this guide from Redfin. Follow these handy steps to switch from your existing deck surface to low-maintenance composite decking. Start with some Perofin to clean and brighten a bench; then apply teak oil to revitalize the wood. It's a simple process, and the results are surprising! My dad and I came up with this Lemonade stand designed to be beautiful but simple enough that kid participation—depending on age or skill level—would be possible.